I've been doing a good bit of cooking the past couple of days as I'm trying to be better about making food for the week to have around and not eat out as much when I'm too lazy to cook. I also need to start chipping away at the 43-POUNDS of organic grass-fed beef I purchased through the Philly Cow Share program. There is a bit of irony about the getting the grass-fed cow because most of the people that I purchased the cow did it for Paleo Diet purposes but about 11 pounds of cow portion were 44-quarter pound hamburger patties that most people would have to eat with a wheat-based burger bun. That's a No-No on the Paleo Diet. I love me a good burger though so I did not let that deter me and when out and tried some burger bun recipes that are wheat free. I was "on a roll" with cooking so I also decided to make a batch of almond-crusted chicken fingers. Generally hamburgers and chicken fingers wreck your diet but I'll walk you through how to make it a lot more healthier and still somewhat satisfy your junk food cravings. 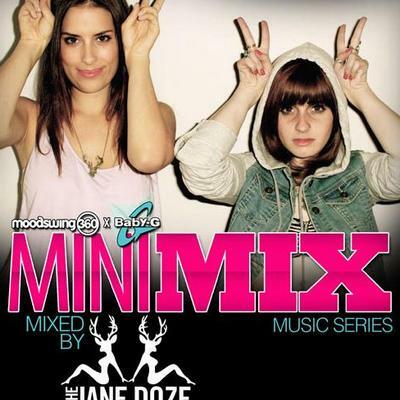 Unintentionally, I'm featuring the Jane Doze again because they just released a mixtape cleverly titled "Girls Talk" This 43-minute mix features a mix of old and new mixes by the girls across different genres. How about a mix with Rihanna, Sia, Afrojack and Porter? They got it with Wild Ones Take Over. Really into that Gotye song that you have on repeat on Spotify? Sprinkle in some Adele, MGMT and some Sebastian Ingrosso and you have Kids Set Fire to Someone That I Used to Know. The opener, No Love Stories Without Pretty Girls is also a treat mixing Taylor Swift with Chris Brown and Usher. Music elitist will really puke with the mix of Drake over Sigur Ros in Replacement Ros. I've been listening to this non-stop since its release yesterday and it really gets you going through a workout.These girls are absolutely on fire with this release with many big things ahead of them. My plan for this year is to go 3 weeks on then 1 week of rest to avoid burnout/injury so this past week was recovery week 1. I still hit close to 8 hours of working out which is respectable. I managed to hit the goal of 4 runs/3 bikes/2 swims/2 strength workouts but as you can see, the volume on the most part dropped off pretty significantly from last week. I did manage to get three regular bikes in because they don't wreck my body as much and did a full distance long run on Sunday because I was feeling pretty good. Although I got two swims in, they were pretty pathetic distances. For the next rest week, I'll make more of an effort to get at least 1600 yds in. I was targeting to do time trials for bike/swim/run but ended up only being able to do the bike test which went exceptionally well. I screwed myself doing a pretty quick but hard leg workout on Tuesday after the FTP test that kept my hamstrings pretty sore through the entire week so a run test would not have been as accurate. I'll probably try to do it this week as part of my workout run for Wednesday. Injury-wise, I still feel the plantar fasciitis on some days but the major thing is it hasn't affected any of my workouts, even the long runs where it usually creeps up. I think the combination of a dynamic stretching routine and using The Stick prior to runs has really kept my muscles/ligaments limber for the workouts. In terms of weight, another week of improvement. I've been using Monday mornings as my "check-in" for stats. Dropped another pound going from 175.9lbs to 174.8lbs and body fat dropped from 9.1% to 8.7%. If I can hit 8.5% before I hit up Vegas next week, that will be awesome. 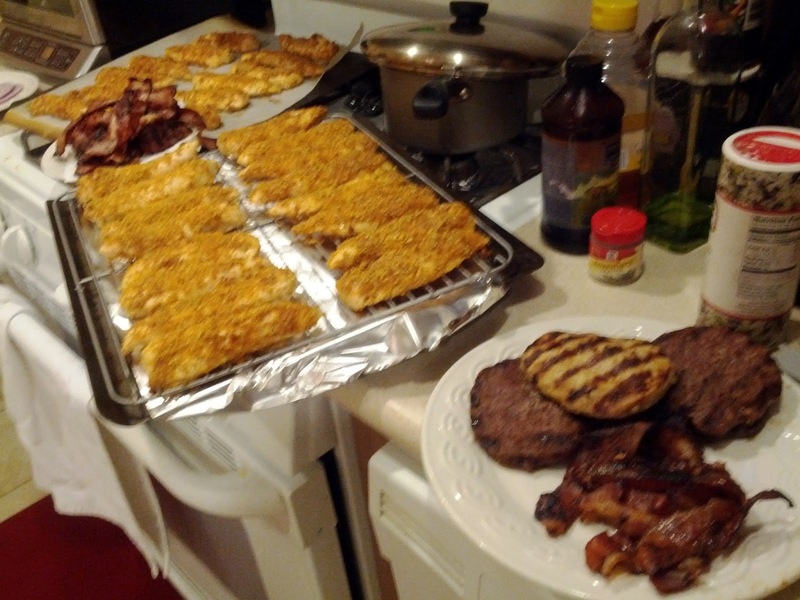 Although there weren't as many "intense" workouts last week, I ate pretty cleanly. The only diet "misses" was Tuesday when I had a work lunch with a customer and ordered the Chicken Marsala at Olive Garden (subbed out mashed potatoes for steam broccoli, no pasta) and on Sunday prior to the long run where I had a hotdog with pulled pork and a bag of potato chips. Overall, I feel pretty rested today. This should be a great week of workouts coming up. Run - Easy 3 mile treadmill run recovery run in the afternoon at 7.0mph. Swim - Woke up later then I wanted to so I did a quick 1100yd swim before work. Strength - Just an upper body lift since legs were feeling sapped from two hard bike sessions earlier this week and leg strengthening. Incline Bench Press Machine, Chin Ups, Shoulder Press Machine, Bicep Curls, Pec Fly Machine, Dumbbell Shoulder Circles, Dips, and weighted row machine. Run - Easy 10-miler to stay consistent with the long runs. Averaged 8:22min/mile. Pace was a bit faster than last week which was expected since this one was mostly on pavement. Felt great and will probably bump to 12 miles next week. I often get requests to share music that I listen to while doing various workouts so I'll start to do a weekly Tuesday post and share some of the jams to freshen up your iPod playlists. For the initial post, here's a 36-minute mix from NYC-based duo, The Jane Doze. The mix was made for the Baby G Mini Mix series and features a broad range of artists like Foster the People, Avicii, Robyn, Usher, Beyonce, Coldplay, and Daft Punk. These girls have been putting out quality mash-ups over the past couple of years and are really making some noise on the scene. I came across the Jane Doze from an earlier project of DJ Rumspringa from when she had a Kanye West/Bruno Mars song featured on Perez Hilton. The girls have been getting a lot of pop lately and they were recently invited to perform at one of the Grammy events in L.A. earlier this month. More of their stuff can be found at their Soundcloud page. This week was another volume week with primary focus on increasing weekly mileage on the run, jumping from 20 miles to 26 miles. I think my body handled the increase fine but I probably didn't give enough time for recovery and had to make adjustments on Saturday. On the bike, I think I'm making great strides getting bike fitness back after taking nearly 3 months off. Current FTP is 238 watts but I think that will jump after this week's test. On the swim, I'm getting more comfortable with the longer main sets which will be critical as I head into the meat of training to swim 2.4 miles proficiently. Injury-wise, the body feels pretty good. The only lingering "condition" I'm still dealing with is the plantar fasciitis that flared up for most of my races in the fall last season. The PF hasn't affected any of my workouts but the first few steps out of bed in the morning are fairly sensitive but sleeping with the Boot/Strassburg sock has helped along with rolling out the calves pre/post run to keep the muscles pliable. Overall, no complaints with this week and looking forward to a "rest week" this coming week which means less volume but more strength workouts and benchmark tests for the swim/bike/run to figure out new pacing. Run - Easy 10-miler on Wissahickon Trail. Pacing felt great, not too slow, not too fast...just easy distance. Target was between 8:30 - 8:45min/mile pace and ended up hitting 8:33 so pleased with this effort. I'm trying to rotate doing my long runs on the trail and pavement to try to keep my legs fresh. I think it was the right decision to add more rest Saturday so that I could have a solid run on Sunday. Swim - Decided to drop sometime in the pool right after the run to make up for not getting it in on Saturday. It was a "free swim" effort meaning no structured workout, just a mix of drills and various repeats. Since I re-focused on diet at the beginning of this month, I've been doing well getting back to race weight. I dropped 1.8lbs from 177.7 to 175.9 from last week, down about 4 lbs so far this month. I'll also take this with a grain of salt because its not real exact with a scale but body fat dropped from 9.6% to 9.1%. Over the past few weeks, I've been getting emails/questions on what it is like to train for an Ironman. Many of them are along the lines of what am I doing, how much of it, how are the workouts spread out, etc. I think its great that there is such interest as folks look to plan their races and goals for 2012. One of the things you can't train is experience but at least it is something easily shared. I've made it a point to track all of my workouts on Dailymile.com which is a great website to log workouts and stay motivated while you are training. I'll also try to put out a weekly re-cap and provide some insight into my training, how I'm feeling, tips and such so that you maybe able to leverage some of what I'm doing into your own training. In a selfish way, putting my workouts online will also hold me more accountable toward hitting the workouts and not slacking off. February has been a good month building base volume. The first week in February I hit 7 hours and 28 minutes of working out. Among this, I hit 8 key workouts (key workouts being either Swim, Bike, or Run) which worked out to 2 pool workouts (3200 yds), 3 bikes (59.5 miles), and 3 runs (16 miles). Unfortunately, I only had one supplemental workout which was the 5K Row I did at 2:30am before heading out to Wing Bowl. This was actually a good week considering that Friday was Wing Bowl and we were partying in Atlantic City all through Saturday Night into Sunday morning. This past week is about what normal training will look like for the next couple of months. The goal is to hit 4 runs, 3 bikes, 2 swims, and 2 supplemental workouts (strength/row/crosstrain) each week. Run - 5 mile run. Main set was a 25 minute tempo run but I could only do 2 x10 minute runs at my T pace. Not sure if I was too aggressive on my target time or if I was still beat up from a hard weekend of partying. Run - 5 mile run. Attempted to do the 25 minute tempo run again and again could only do 2 x 10' at T pace. I think my "fast pace" endurance isn't built up enough yet but I'm determined to be able to get past this workout and try it again this week. Swim - 2200yds. Mainset was seeing how fast (or slow) I could do 1600 yd in. Good news is that I broke 30 minutes for the first time, 29:20. I'm going to have to get it down to 28:00 to have a competitive 1.2 mile swim. Strength - Quick circuit after the swim consisting of 4 rds: Cable Chest Press, Cable Straight Arm Pulldown, Dumbbell side raises, Bicep curls, and Water Ski Rows. Run - Didn't get this going until 5pm because I was tried/hung over from a Saturday night at the bars. I wanted to mix up the terrain I was running on and chose to run on the Wissahickon Trail. I wish I would've checked it out beforehand because it was icy as hell. Probably not the best decision to do a long run on ice but I made it through fine. The goal of this run was easy pace around 8:30min/mile average and hitting 8 miles. Ended up averaging 8:31 which was perfect considering the icy conditions.